Mr. Yogato is as fun as its name. What started as one rocket scientist's craving for delicious, healthy, tart frozen yogurt when he moved to D.C., has become an amazing labor of love and yogurt for multiple rocket scientists and their friends and family. Every single part of Mr. Yogato-from the name, to the décor, to the flavors and toppings, to the music and entertainment-has been rooted in fun and goofiness, the way that Mr. Yogato's owners would like EVERYTHING in the world to be. You will sense this the second you walk in the door. 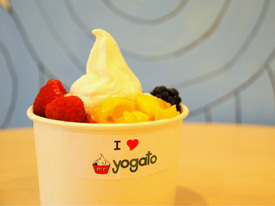 Consistent with its mission, Mr. Yogato caters to fun and games. For example, employees will play trivia games, encourage sing-a-longs, and challenge you to answer thought-provoking questions of the day (e.g., if you were going to a desert island for life and could only take 5 beverages, what would they be?) on a huge white board. As you will see from the Rules of Yogato, you will be constantly rewarded if you choose to participate. Otherwise, no biggie, you still get to eat delicious frozen yogurt! Mr. Yogato also provides free wi-fi if you want to stay and hang out for a while. As for the yogurt, Mr. Yogato will carry 18 delicious, non-fat yogurt flavors (in addition to our original, we will also have flavors like mango, mojito, black cherry, etc. which will be rotated and served 4 at a time). Mr. Yogato will also offer 40 different toppings. And, because we want this to be enjoyable for you, we are always open to suggestions for new ones. For example, when a friend of Mr. Yogato recently recommended olive oil as a topping, Mr. Yogato founder Steve Davis thought it was a CRAZY idea but decided to add it in any event (he then tried it and thought it was strangely yummy). Although we cannot promise to accommodate every suggestion made, we look forward to the opportunity of making Mr. Yogato as fun and delicious for you as it has been for us. We look forward to seeing you at Mr. Yogato (and hearing you order in a funny accent). Mr. Yogato's Birthdays Are Awesome!!! June 27th, 2009: 1st Birthday 8-Hour Festivities! June 26th, 2010: 2nd Birthday Concert! June 25th, 2011: 3rd Birthday Scavenger Hunt! June 30th, 2012: 4th Birthday Flash Mob!